Its true and we all know it. If you have your heart set on designer gown, buying a knock-off may seem the same but, it’s not. Not only the designer tag, some key elements may be missing. The same goes with jewelry, shoes, and just about everything else. Here is a look at the pro’s and cons of the real vs. fake argument. Gown– Buying a less expensive copy of a designer gown is only a good idea if it is made well, made of quality fabric and has all the same elements that made you fall in love with the gown in the first place. Headpiece– The same headpiece for less money made poorly is usually a disaster. Once your hair is done, having a headpiece that is poorly made can fall apart and will most likely destroy your hairstyle. Eyelashes – Applied by a professional individually or even in strips is fine. Doing it yourself is probably a bad idea unless you have tons of practice. Otherwise, they will look like caterpillars stuck to your eyelids. Hair – Even the best hair extensions can ruin your hair for a period of time. The good news it is rarely permanent damage but it does escalate permanent hair loss if you are already prone. Bad hair extensions look like hair plugs and can fall out in clumps at any time for no reason. If you decide on hair extensions for your wedding, make sure it is done professionally and short term only. Tan – Over exposure to the sun in tanning beds and in real life has a negative affect on your skin. Self spray tans have a distinct odor and can streak or come off on your clothes plus they usually come out looking orange. The best idea if you must tan before your wedding is a professional spray tan no less than 5 days before the wedding. Exfoliate the day before your wedding to avoid discoloration of the gown. 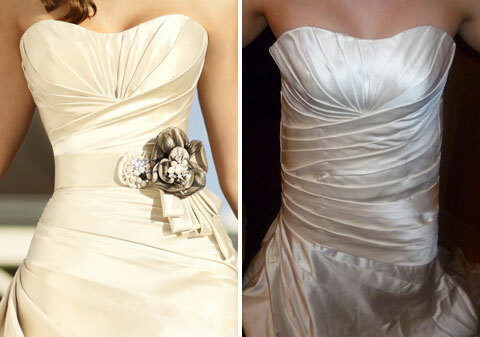 Brides everywhere agree: if they could splurge on just one item for their wedding -it would be their bridal gown. Maybe they have dreamed of a certain gown their whole life, maybe they recently spotted a designer must-have or maybe they just tried on a gown out of budget that they cannot seem to live without. Fit – The gown should fit your body type. Just because it looks good on a model or mannequin does not mean it will hug your curves the same way. And it if it doesn’t look good on the runway or in a magazine, it will probably not look good on you. All designer have their own patterns whether it is fuller in the bust or more ample in the waist so find the right fit for you. Fabric – The fabric should be beautiful and easy to care for. Stylists and designers everywhere are still buzzing about the late Princess Diana’s bridal gown debacle. Remember how she came out of the carriage a wrinkled mess? Silk taffeta is a gorgeous fabric but does not travel well. Make arrangements to get dressed AT the venue to avoid problems like this, if you can. Finish – The gown should be as beautiful on the inside as it is on the oustide. No unfinished seams, no boning sticking out, no loose threads and no puckers. The hem, the zipper, the closures (hooks or snaps) should all be tightly and neatly sewn. If there is lace or appliques, everything should be sewn symmetrical, smooth and neat as well. Feel – When you put the gown on it should not only make you feel beautiful, it should also feel comfortable. Do you want to be gasping for air or tugging at the waistline of your gown for the entire day/evening? Is it so tight you have backfat? If you feel good, you will look good. If the ‘gown of your dreams’ has all of these qualities, then go ahead and splurge. Splurge a little -not a lot. You should never go too far over budget. Of course you want to look beautiful but, if you spend WAY too much on the bridal gown, you will have to cut expenses somewhere else and you want your entire wedding to be memorable – not just the gown. Remember, everyone has budget. Whether your budget is $1300 or $13,000, there is a gown for you. Designers are now rolling out their 2012 designs as we speak and I have a feeling the gown of your dreams is waiting for you. With Spring just around the corner and designers about to reveal their new fall lines, there is a light at the end of the tunnel for brides who are not sure they want to go strapless. Did you notice it at the Oscars? A little sleeve here and there. Not long, puffy leg-o-mutton sleeves like the 1980’s (God forbid) or severe turtleneck dresses like the 1970’s. Just a little something to comfort the bride who is not sure she is ready to bare her shoulders completely. For years, the strapless bridal gown has dominated the runways and magazine pages as the ‘style choice’ for nearly every major designer for over a decade, couture and otherwise. This spring, that could all change. Although strapless gowns are still the majority shareholders of our attention and account for most bridal gown silhouettes, I counted 10 of the top 50 Knot Picks for favorite wedding dresses as having some sort of strap or sleeve. If you’re counting at home, that is about 10 more than this time last year. What does this mean to the bride-to-be? The sky’s the limit and the choice is once again, yours. The designers have heard your voices, asking for “something on top” and they have responded by giving you exactly what you want. Maybe its a modesty issue, maybe its a matter of taste, perhaps you have a figure concern and feel strapless is not the right choice for you. We get it – and now we know that designers all over the world (from haute couture to the most affordable) will be showing you what you have begged for… a little coverage. That’s not to say strapless has gone by the wayside – quite the contrary. The strapless gowns that we see today seem to magically camouflage some of the most common figure flaws. Built- in bras, petticoats, corsets, these things take away the guesswork and the end result is a gown that makes you look and feel like a million bucks on your wedding day. Each week at Bridal Expo you can see the hottest looks in bridal and attendant gowns straight from the designer’s runways to ours. If you or someone you love is getting married, please take a moment to watch our couture runway video and call 847-428-3320 to get four complimentary tickets to a show in your area.